NRA puts on the World's longest running shooting and hunting show featuring 78,865 attendees and 550 exhibitors, all uniting from around the world in the celebration of the Second Amendment. A true demonstration of great patriotism and good old fashioned family bonding. Music City Center in downtown Nashville hosted the weekend for attendees to enjoy LIVE country music in addition to the latest and greatest from the outdoor and firearms industry. On Friday, the NRA- ILA Leadership forum boasted some of the most political figures in the country including Jeb Bush, Ted Cruz, Marco Rubio, Rick Perry, Scott Walker and more. There was fun for the entire family with an NRA Youth Day, where over 400 youth attended experiencing the Youth Hunter Education Challenge (YHEC) Wildlife Identification, 3 Gun Experience Air Soft, and more. Women's Leadership Luncheon, was a room full of philanthropic women united with the mission of fighting for the Second Amendment. Envigorating passion in attendees to help lead the change in discussions concering gun control and beyond. Country music stars, Hank Williams Jr., Ted Nugent, Tyler Farr, Rascall Flats, and more. Be sure to book your trip and plan on attending the 2016 NRA National Meetings in Louisville. You love to hunt. You love to shoot. You love your girl. Maybe it’s time to put all that together. Aim at the high mark and you will hit it. No, not the first time, not the second time and maybe not the third. But keep on aiming and keep on shooting for only practice will make you perfect. Finally, you'll hit the bull's-eye of success. Not every American woman has the sharp shooting prowess that led Annie Oakley to fame. In fact, many women are afraid to have a gun in the home, let alone shoot or train with one. Making the decision to own a firearm for personal protection, hunting or the shooting sports requires some homework. But prior to gun ownership, let’s talk training. Shoot Like A Girl (SLG², Inc) is a company dedicated to growing the number of women who participate in shooting sports by empowering them to particpate with confidence! Look for Shoot Like A Girl at six Cabela's Grand Opening Celebrations in 2015 and RMEF's Hunter Christmas. 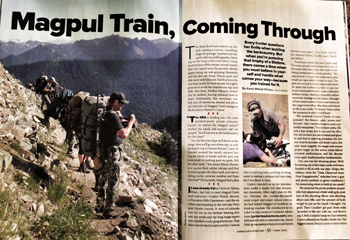 This months issue of the National Rifle Association's American Hunter ‬Magazine features an editorial by Senior Editor Karen Mehall Phillips detailing, in a six page article, the Magpul Core Backcountry Hunters course we took together last summer. "Every hunter questions his/her limits when tackling the backcountry. But when you're pursuing that trophy of a lifetime, there comes a time when you must believe in yourself and handle what comes your way-because you trained for it." The 5 day course consists of 2 days on the range and 3 days on the mountain. 1. Do you know how to get into a safe, stable shooting positions? Do you understand your natural point of aim? Can you compensate for wind speed with your scope turrets to ensure a humane kill? 2. Can you regulate your water, electrolytes and calorie intake on an ultra-physical hunt? Are you prepared for weather changes on the mountain? Do you understand signs of heat stroke & hypothermia? Do you have the proper gear? 3. Say you shot an elk. Scanning the topi map, do you know at what grid it ran into the woods? Can you orient your compass and plot a grid to get there by easiest route-or did you drop 1000 feet only to have to climb up again? 4. In an emergency, can you get out of the woods? Can you report your position? Are you equipped to survive in the cold and rain or worse until help arrives? If you hesitated answering any of the above or just want to brush up your skills, Magpul Core's Back Country Hunter Course is for you.